Lacrosse sticks that are available for sale at "big-box" sporting goods retailers are often not "factory-strung" in a way that is conducive for successful use. New players are advised to consider purchasing a beginner stick from a source that provides better options. The Midland Lacrosse Club has partnered with StringKing, an online retailer of high quality lacrosse heads, mesh, shafts, and other supplies. StringKing offers options appropriate for players at all levels, from the beginner all the way to the seasoned veteran. An email will be sent to you with a discount code during checkout. For beginners, you can buy a complete "beginner" stick from StringKing. If you buy one from somewhere else, we recommend soft mesh and a mid or low pocket for beginners. Please contact Coach Brillhart if you are interested in purchasing a stick from StringKing. For boys players in the 10U and 8U divisions, we recommend the Complete Jr. youth lacrosse stick from StringKing. We have a few of these high quality sticks for sale. For beginners, lax.com recommends either the STX Crux 100 or STX Crux 400. StringKing also offers a complete stick for girls, and lax.com recommends it (or the Nike Lunar Elite) for intermediate players. The crosse shall be an overall fixed length of either 40 to 42 inches (short crosse) or 52 to 72 inches (long crosse), except for the goalkeeper’s crosse, which may be 40 to 72 inches long. 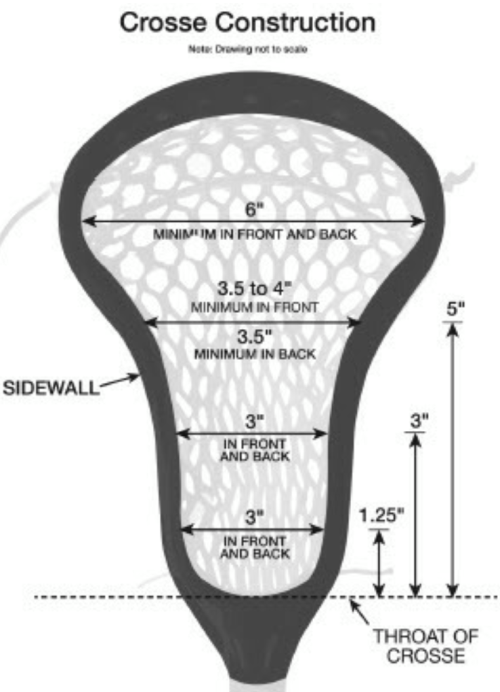 All StringKing heads fit the dimensions, so new parents/players buying them know that the stick head is legal. If you are currently using an older head, you should check to make sure it is compliant (some older or hand-me-down sticks may be illegal this spring). The most common and recommended pocket for all levels is a mid to low pocket. The advantage of having a high pocket is that it has the quickest release of the three pocket types. This does not mean that the ball will go faster out of your stick, it means that it will take less time for the ball to leave the pocket. This happens because the distance of where the ball sits to the top of the stick is shorter than a low or mid pocket. The disadvantages of having a high pocket is that the ball will come out of the stick much easier when cradling up and down( with your stick perpendicular to the ground) with a high pocket. Also It is common for a high pocket to have inconsistent throwing patterns and because of this a high pocket is only recommended for very advanced players. A Mid Pocket is just as the name suggests, a middle of the road selection. A mid. pocket gives a good release and a good throwing pattern, but the release will not be as good as the high pocket and the throwing pattern and ball retention will not be as good as the low pocket. But, the Mid pocket is the best all around pocket in regards to ball retention and throwing pattern. The two most common types of mesh available are HARD and SOFT mesh. Below are some descriptions of their advantages and disadvantages (excerpted from stringerssociety.com). The mesh is not only easy to string, but it is ready to play with immediately as well. Unlike Hard Mesh, which takes some break-in time, Soft Mesh is instantly going to perform and hold the ball in a snug way to help with control. Soft Mesh performs like a well-broken-in traditional that shifts with the ball when you play...If you are a parent/coach that is looking to teach very young kids the proper mechanics and fundamentals then Soft Mesh would be a great choice for the young players. The mesh will help with their ability to catch, ground ball, and cradle at a young age so they can potentially move on to a different mesh once they have those skills down. ...[Soft] mesh does not last well in the outside elements...[and] does not retain its shape and will stretch or “bag-out” over time. This means that there will be more maintenance needed for a soft mesh stick over time than Hard Mesh or Performance Mesh. The desired shifting of the pocket that soft mesh provides will make it move out of place and require some restringing the more you use it to keep the pocket that you want. This means inconsistency if you are not always keeping your stick in tip-top condition. ...Hard Mesh does give a very consistent pocket...This mesh lasts too. Hard Mesh not only takes time and patience to break in, but it also can not give players the control they desire. The harder your pocket, the less it will shift with the ball. This means that you will have a hard time naturally feeling where the ball is in your stick...Another disadvantage that Hard Mesh can have is that it can be difficult to string for a solid pocket and hard to handle the ball with if you are inexperienced. The rigidness of the mesh makes it difficult for players that don’t have a lot of skill to catch or pick up the ball because it doesn’t have the “give” that Soft Mesh does. The USTRING section of the StringKing web site provides instructions and videos for stringing a wide variety of lacrosse heads and pocket types. This is a good resource with instructions you can follow to string your head yourself.